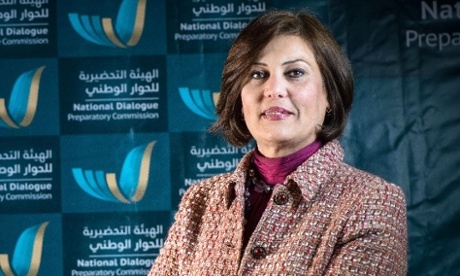 The Libyan human rights activist Salwa Bugaighis has been shot dead by unknown assailants at her home in Benghazi on the day of the country’s general election. “Unknown hooded men wearing military uniforms attacked Mrs Bugaighis in her home and opened fire on her,” said a security official, who did not wish to be named. She was shot several times and taken to hospital in critical condition, where she died shortly afterwards, a spokesman for the Benghazi medical centre said. Her husband, who was in the family home at the time of the attack, had since been reported as missing, a family member said. “We’ve lost touch with him,” the relative said, adding that a security guard at the house had been shot and injured. Bugaighis, a lawyer, played an active part in Libya’s 2011 revolution, which overthrew the regime of Muammar Gaddafi. A former member of the National Transitional Council, the rebellion’s political wing, she was vice-president of a preparatory committee for national dialogue in Libya. The US ambassador to Libya, Deborah Jones called the news “heartbreaking”, and on her Twitter account denounced “a cowardly, despicable, shameful act against a courageous woman and true Libyan patriot”. Earlier on Wednesday Bugaighis had participated in Libya’s general election. She published photos of herself at a polling station on her Facebook page. Since the 2011 revolution the east of Libya – and in particular the country’s second city of Benghazi – has been a stronghold for jihadists, and the scene of attacks and assassinations targeting notably the military, police and judges. At least three soldiers deployed to provide polling day security in Benghazi were killed in what security officials said was an attack on their convoy by Islamist militia. Benghazi, which was the scene of a deadly attack on the US consulate in 2012, has been tense since a rogue former rebel commander launched an offensive in May against powerful Islamist groups, drawing many regular army units to his side. Posted on 26th June 2014 by newsafrica. This entry was posted in Africa, Arab Spring, Democracy, Human Rights Violations, Libya, Women's Rights and tagged Africa, Benghazi, Gaddafi, Libya, Libyan, Military uniform, Muammar Gaddafi, Salwa Bugaighis. Bookmark the permalink. « Has the real #BabaJukwa been arrested?